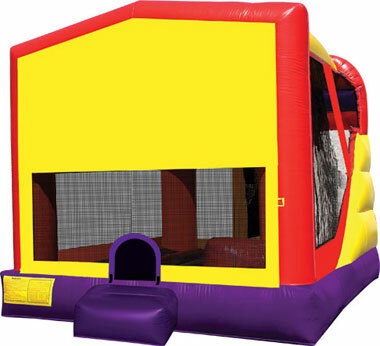 4-in-1 Modular Combo Rental - kiddo kingdom : Inflatable Fun, Parties and Rentals! This inflatable is FOR SALE and no longer available for renting.Built-in Slide Inside! 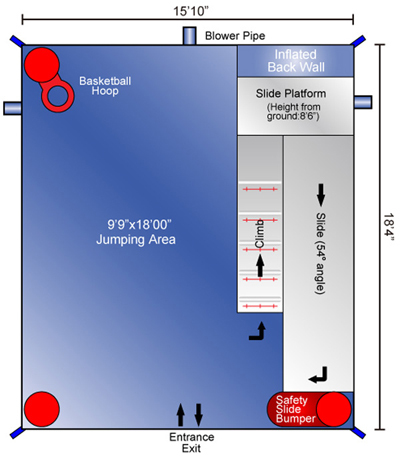 This 4-feature challenge is jam-packed with fun, offering a generous section of jumping area, basketball hoop, climb and built-in slide. The front has embossed heavy duty Velcro for Inter-changeable art panels to feature your favorite, timeless characters and themes that add versatility and ‘play value’ to fit any party’s theme! If you are interested in buying this used inflatable, Call 903-390-4114 today. It still has a lot of life left in it. FREE set up and delivery^ with this rental. Prices shown must add sales tax. Submit no obligation RSVP for the 4-in-1 Combo now! All prices shown must add sales tax. *1 Day ranges from 4-12 hours, sometimes longer and is not guaranteed. 3 Day Starting on Monday or Tuesday means if we set it up Monday, we'll take it down Wednesday, or if we set it up Tuesday, we'll take it down Thursday, ensuring up to a minimum of 36 hours, but not guaranteed. Ultimate Weekend means we'll set it up on Friday and take it down on Monday, ensuring a minimum of 48 hours. ^Free Delivery to the Temple-Belton area; a delivery fee may be imposed for distances beyond those immediate surroundings. Submitting this reservation does not guarantee availability on the date of your event, nor obligates us to make it available. We'll respond to your RSVP submission ASAP. Don't hesitate to call the Party Rental Hotline to check availability.